In the "Flowers" template which is available for free in the templates download section of WWB, there is a semi transparent white strip behind the "Flowers" text. Same kind of semi-transparent white strip is used in the template "Donuts" too. I checked the object and it was a text object and there were no any layers on which the text was placed. I tried to get the same kind of strip for my text but the background always turns into solid color background. I'd like to know how the semi transparent strip was brought behind the text as background for text area. Is there any code which needs to be added in the webpage html? 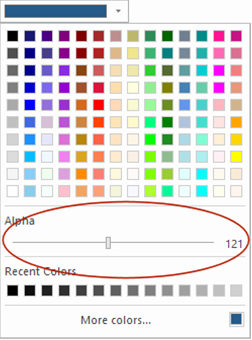 You can set the alpha value of the background color in the color picker. Thanks a lot! I never thought about this option.